The biggest thing I’ve learned since starting this new phase in my running career is that not everything goes as planned and that’s okay. If preparations went perfectly, I would have slept well after my 3k in Seattle, not gotten sick the next Tuesday and been able to do a workout with my team to get ready for the mile in Boston. I would have known exactly what and where I was racing the week after Boston, but neither was the case. In hindsight I feel a little funny thinking about the fact that I almost didn’t go to Boston. Yes, racing when you’re not feeling well is terrible and a bad idea when your next race is a week away. I didn’t want to run poorly and then make myself even more sick by traveling. But after sleeping for 12 hours that night, I woke up Wednesday feeling like a new person. My only hesitation then was that I had missed the workout. What if I wasn’t sharp enough to race? It definitely made me nervous, but I couldn’t miss a chance at a good race and a big PR. I’ve always loved racing in Boston, and this time was no different. Kate Grace took us out perfectly, again, and I owe her a lot of thanks for another PR. Before I got on the line, Gag told me not to leave any gaps, which is something I remember Coach Fox always saying as well. Both of them were there watching and I could hear them cheering, but I watched the Flotrack video of the race, I could see myself fall back half of a step and then get right back on where I know they were both in my head. I was thrilled with a 6 second PR (4:31.3) and to be able to see my teammate, Amanda Winslow, run the third fasted time in the world just ahead of me (4:26.28). The week that followed was a mess of confusion. The plan was to fly out to Iowa and run another 3k. We tried to get into the Millrose 3k, but the heat was over full so even waiting to see if someone scratched wasn’t an option. And then Mother Nature attacked New Jersey again. My flight was canceled and there were no other flights going out in enough time for me to get to Iowa and prepare for my race properly. My indoor season was over and it was time to gear up for spring…until another curve ball was thrown at me. Flights getting into New Jersey were being canceled as well, which meant that a spot opened up in the Millrose Wanamaker Mile. I owe an I’m sorry/thank you to Katie Mackey, who couldn’t make it out of Seattle, and a big thank you to David Monti of NYRR for making me a last minute addition. He’s right; it doesn’t matter if I knew all along or if I found out when I did. I’ve been training hard and racing well and I was presented with an amazing opportunity. I wish I could say that I took the quote and ran with it (see what I did there? ), and had the most incredible race of my life, but it didn’t quite go that way. No one went with the rabbit and it turned into a jumbled mess until 800 and I just didn’t have the same strength or speed to go from there. I felt tired and flat. The crazy thing is that if I hadn’t run in Boston the week before, the 4:35 that I’m disappointed with would have been my new PR. I also know that it was really great for me to have that experience. Actual racing like that is different from time a time trial-type race and I needed that experience on a big stage. Now I need to work on having the courage to be the one that pushes the pace when the rest of the field doesn’t, and/or put myself in a better position to go. Full of new experiences from the past month and a half in Texas, Seattle, Boston, and NYC, I’m ready to reboot for the spring season. I can never seem to say thank you enough for all of the support via all forms of social media. More good things to come! Ending #springtraining by flying to Oiselle City (aka Seattle) and kicking off the 2014 season was such an awesome idea. I had run the 3k at the Dempsey twice before and both times were PRs and great trips, but doing it in flystyle was pretty special. I had really been looking forward to meeting the Little Wing women and getting to know them. We first met up with them Thursday morning when we got to act like models and do a photo shoot in some new Oiselle duds. Then Amanda, Kate, and I headed to the track for our pre-race workout. I’m running out of adjectives to describe how I’ve felt for our activities. Everything was just AWESOME! On Friday I got to see the Oiselle HQ for the first time. It’s very cool spot just a short walk away from where we did yoga with Jasyoga founder and head coach Erin. I have been following all of her posts on the Oiselle blog page in my quest to get into yoga this year. Normally I’m not one for trying something I have never done before a race, and yoga has certainly never been part of my race prep. I went into it with the plan of hanging out with my legs up on the wall if there was anything I didn’t want to do. But I ended up doing the whole thing. It was all very light and relaxing. Every so often Erin reminded us not to visualize the race, but to think about and take in the feelings that we experience when we have accomplished our goals. I really liked that exercise and it’s something that I can keep in mind when prepping mentally for all of my races. Then yesterday was go time. I stuck to my trusted race day routine; shake out jog, breakfast (though I took a risk and had oatmeal instead of pancakes) while watching ESPN College Game Day (GO CUSE! ), hang out in the room watching Netflix, go for a walk and get a sandwich, shower, and have some coffee as I head to the track. I could feel myself getting a little nervous. I raced on the roads a couple times this fall, but this was my pro track debut. I knew I wanted to break 9:00 but sometimes I have trouble saying my exact goals out loud. It’s like I need to protect myself in case it doesn’t happen. Instead I told myself it would be good to PR and great to break 9:00, but I knew the whole time I wouldn’t be totally satisfied if I saw a 9:01. We got on the line and Kate Grace was announced as our rabbit. She did a really awesome job; the race felt so smooth. I felt really strong and we got the wheels going a little for that last lap. That feeling that Erin had us embody the day before was all there, plus some. 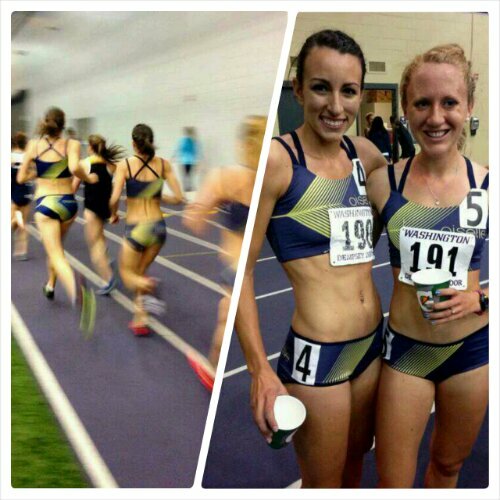 Amanda and I went 1-2, respectively, each with big PRs of 8:56.37 and 8:56.44. I felt so proud to be part of Oiselle and NJNYTC. And to be a Syracuse alum! By the time I cooled down, Cuse had taken care of business in the Dome with Duke. As I said before, we finished off the night with a celebratory team dinner. Heading back to New Jersey (which seems like the Antarctica after spring training in San Antonio all month) tomorrow night. All kidding about the weather aside, it’ll be good to be home. More work to do!